A $25 non-refundable deposit is required to book all service & consultation appointments. This fee is deducted from your total on your appointment service date. Come With The Hair U Want, Leave With The Hair U Want! No Matter How Devastating U Think Your Hair May Be? WE CHANGE LIVES!! "I am Honored that you choose me to service you and all your haircare needs!" We offer affordable but great quality work... Please click on the link below to see a list of the services & schedule times that are available to you! Please note Deposits are Due upon scheduling and are NON Refundable! !1st time clients YES deposit does go toward your payment!!!! However should you miss your appointment anytime after that, you will forfeit your original deposit and be required to make another before choosing a different appointment date. All clientele: I highly suggest booking you're recurring appointment in advance at least 3-4 weeks. WE SUPPLY YOUR HAIR, however we welcome all hair. 2-3 bundles are recommended for full sew ins, No cut up extensions & have them pre-washed (clarifying shampoo recommended) and dried before appointment unless you add to your service prior. Under 18yrs? You must have parents or spousal consent when booking & paying for services. There is a non refundable and non transferable deposit required before booking. There are no refunds on services. You will not be charged if you cancel at least 24 hours before your appointment starts. Otherwise, you will be charged 50% of service price for late cancellations and 100% for no shows. DEPOSITS ARE NON-REFUNDABLE UNLESS CANCELLATION ON OUR END. Wig/bundles/hair-extensions/lace-closure/lace-frontal (NO REFUND/NO EXCHANGE) any maintenance/ or re-service fees will apply. **AT&MH reserves the right to change this policy from time to time as it sees fit and your continued use of the website or booking services signify your acceptance of any adjustment to these terms. 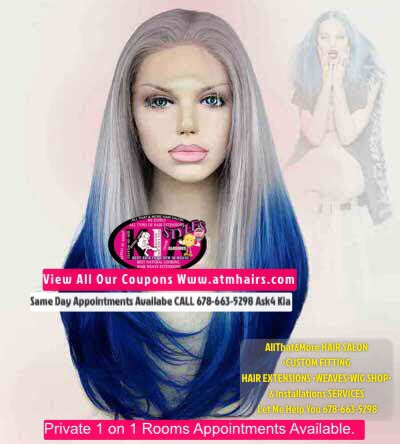 If there are any changes to our store or salon policy, we will announce that these changes be made on our home page www.atmhairs.com and on other key pages on our website & posted inside our salon. IF U WANT 2 ACHIEVE IT..I'LL WEAVE IT...IF U CANT GROW IT, I'LL SEW IT & NOBODY'LL KNOW IT! No Matter How Devastating You Think Your Hair May Be? WE CHANGE LIVES! We want you to feel comfortable before you schedule or make any purchase with us. Should you have any questions or concern, please do not hesitate to call 678-663-5298 ask 4 Kia she will introduce you to options you may never even known exist. $25 Consultation Which Type Of Hair Extensions Are Right For Me? Consult a ATM&H expert to evaluate your needs, your lifestyle and your budget in order to find the best hair extensions, replacement & treatment. 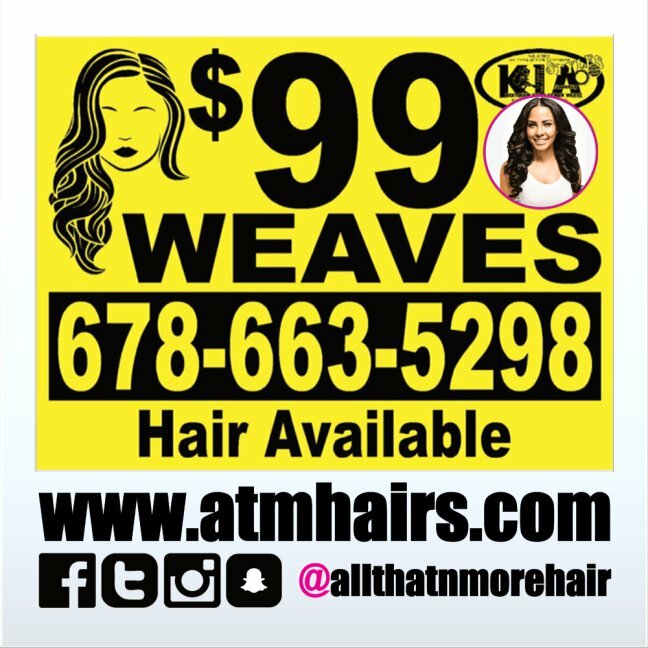 This service also includes deciding which methods of attachment will best suit you and your new protective style hair system, wig, unit, prosthetic or hair piece. A Security Deposit per person must be paid at the time of booking to secure an appointment. If a deposit is not paid within 2 hours on a booking, we have the right to cancel the booking. Your security deposit will be applied towards your service(s). WHY DO WE REQUIRE A SECURITY DEPOSIT? Every set is individually custom-made to match each client's hair color, texture, style, length, thickness and head measurements. Due to the Nature of this Product All Sales Are Final! No Returns Or Refunds After Finalizing & In-Store Pick up. 3 BRAZILIAN STRAIGHT 10” BUNDLES For those who want it given to them straight, our collection of 100% virgin straight hair is your go-to for a sleek look with minimal effort. Description: Tape In Hair Extensions are attached quick and easy by pressing two adhesive, invisible gel strips towards each other with a part of your own hair in between. The extensions are completely invisible since the are lying flat down towards your head. Description: Looking for hair that feels like they’re not even there? Fusions hair are the way to go! They are bonded to your natural hair with a gentle protein adhesive. Details: They can be washed and styled just like your real hair and come in a variety of colors and textures to ensure a perfect match. If you don't oil your scalp often, then Fusions could definitely work for you. Description: Microlinks Hair Extensions are one of the absolute healthiest method of strand-by-strand extensions. Attached via tiny microbeads without any heat or chemicals, Microlink extensions are light and natural looking! 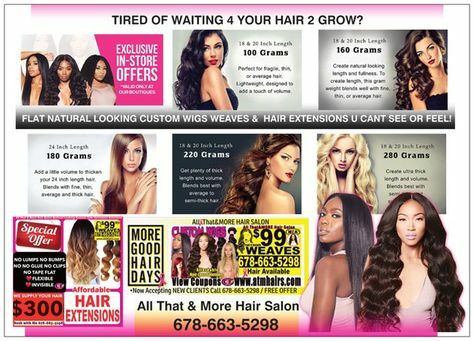 Details: Free of any braiding, glue, tracks, or clips, these premium micro links hair extensions feel just like your real hair. Lighter Colors/Partial installs/24 Inch or Longer: Please call, instant message or book a consultation for accurate pricing. Description: Microlinks Hair Extensions are the absolute healthiest method of strand-by-strand extensions. Attached via tiny microbeads without any heat or chemicals, Microlink extensions are light and natural looking! Want the natural look and volume of sew-ins, without the headache and itchiness of the braids? Our #Braidless Sew-in Extensions are perfect for you! Want the natural look and volume of sew-ins, without the headache and itchiness of the braids? Our Braidless Sew-in Extensions are perfect for you! No more than 2 lines. Perfect for adding volume using hair that is very close to the natural length. my signature Flat Flexible Invisible 100% Human Hair Double volume Secret Hidden Hair Extensions with your hair included. 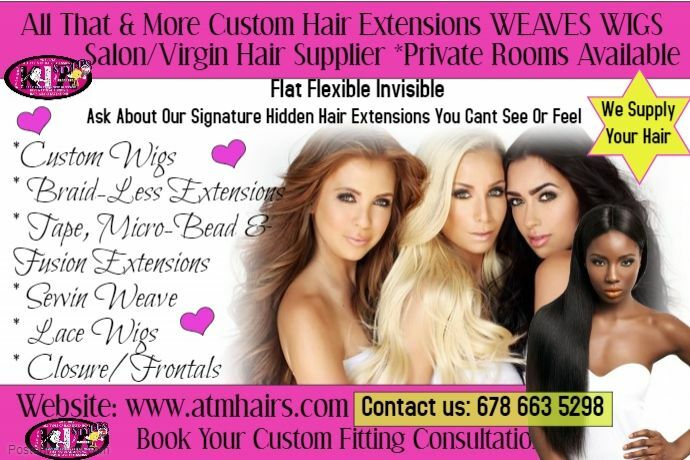 Hair extensions you cant see or feel. ​NO sewing, NO braids, NO glue, the most natural weft technique. The Non Sewn Beaded Weft (NSBW) technique is a client favorite said to be the most comfortable and reliable of all weft techniques offered. The NSBW method eliminates the use of sewing. Mouisture Rich hydrating & Rejuvenating penetrating scalp treatment included. All That & More Hair Salon Custom Signature Invisible Hairline Prosthetic Systems Are Genderless – What’s Wrong With A Man wearing ATMH Signature Custom Invisible Hairline System? I’m sure I’m not the only one that has heard of the “Hair Membership Clubs For Men”? What exactly do people think goes on there? Sure, they may not slap a hair prosthetic on a balding man, but a hair transplant isn’t transplant isn’t exactly like growing your own hair. Men are no different from women. Tired of waiting for your hair to grow? Get Longer Thicker Hair In An Instant. Want All That & More hair that's worth an encore? Our premium virgin hair clip-ins in Brazilian Straight give you flowing and luxurious hair in an instant. Without the commitment, you can have low luster, quick and easy to apply clip-in hair extensions that will get you a standing ovation! Save your precious strands and top your look off with the ultimate tool in protective weave styling. Our collection of closures blend seamlessly with our bundles and can be customized to fit your unique look. 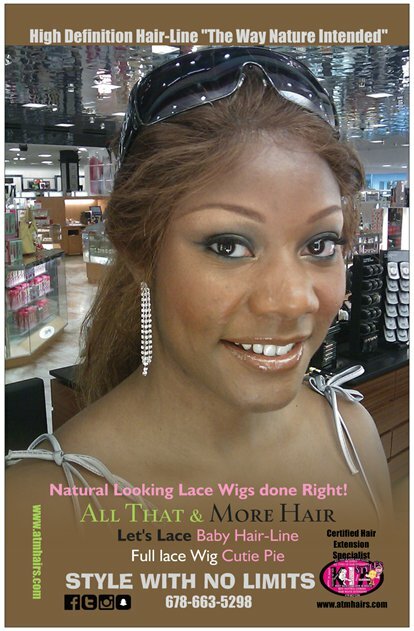 100% human hair, hand-tied 4" x 4" lace closures provide a realistic part to close off any unit or install. Lace closure and up to 3bundles when you purchase our hair. $25 additional bundles Hair must be pre-shampoo Your styling options are endless. .No Lumps No Bumps Great for lady's with natural hair (no relaxer no problem), thick, more texture hair or very short hair, severe hair-loss thinning-hair no-edges no-hairline. No matter how devastating you think your hair may be.. WE Change Lives!! If U Want 2 Achieve It, I'll Weave It. If U Can't Grow It, I'll Sew It & Nobody'll Know it..
No more than 2 lines. This is perfect for adding just a little more volume and maybe a bit more length to your own hair. Lines of extensions is weaved into your hair. 1 bundles minimum his is perfect for adding just a little more volume and maybe a bit more length to your own hair. Lines of extensions #weaved / #sewn into your hair. 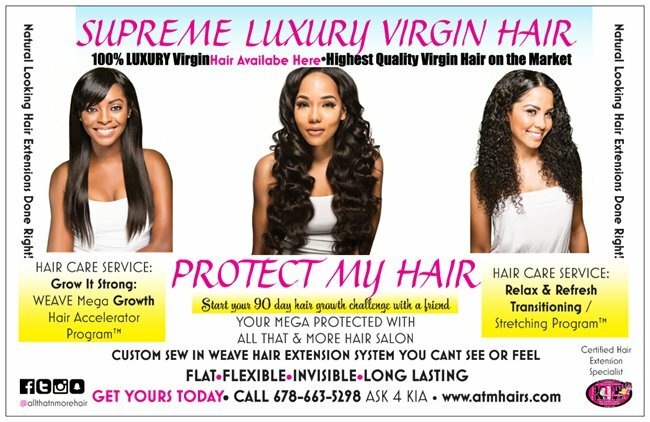 WEAVE MAINTENANCE *Protect & Grow Your Hair Under There Scalp Treatment, tighten, and basic style. For best maintenance we suggest this every 2-3 weeks. Weave Maintenance 10- 12"=$65 *Includes shampoo, tighten, and basic style. Weave Maintenance/Refresh 14- 16"=$75 *Includes shampoo, tighten, and basic style. Weave Maintenance/Refresh 18"=$85 Includes shampoo, tighten, and basic style. Weave Maintenance/Refresh 20"=$95 Includes shampoo, tighten, and basic style. Weave Maintenance/Refresh 22"=$95 Includes shampoo, tighten, and basic style. Weave Maintenance/Refresh 24"=$105 Includes shampoo, tighten, and basic style. Weave Maintenance/Refresh 26"=$115 Includes shampoo, tighten, and basic style. Weave Maintenance/Refresh 28"=$125 Includes shampoo, *Protect & Grow Your Hair Under There Scalp Treatment, tighten, and basic style. For best maintenance we suggest getting your weave shampooed and styled every 2-3 weeks. Includes wash, sit under the dryer and basic style.